A 2 player fighting game, with lots of customization options and more to come. Very difficult second boss, 3rd boss is a little underwhelming because I could just hide behind the land mass in the bottom left, and initially I just stood where the girl was (because she wasn't moving) and he actually didn't shoot there until his 2nd phase. Where's all the info at? In my first playthrough I had absolutely no idea what was going on because I didn't read the readme (as the readme is quite long and they are often unnecessary). Still, even in my second playthrough (after I read the readme) the game wasn't very fun and it was very easy. Less information... the bottom log moves way too fast! What's the point of Stat: X/10 if they can just exceed 10 anyway? You can tell someone's guild just by their image, don't know if that's intended. This is an amazing game and I love it — the original and this! :) The controls were hard to figure out on my own and so were the mechanics, though, since I've never actually played the game myself. The pixel art is really good and I definitely immediately noticed it was an INSIDE demake just from the image on your twitter (@8Bitalo). The page text could use some brightening to make it easier to read comments, though. 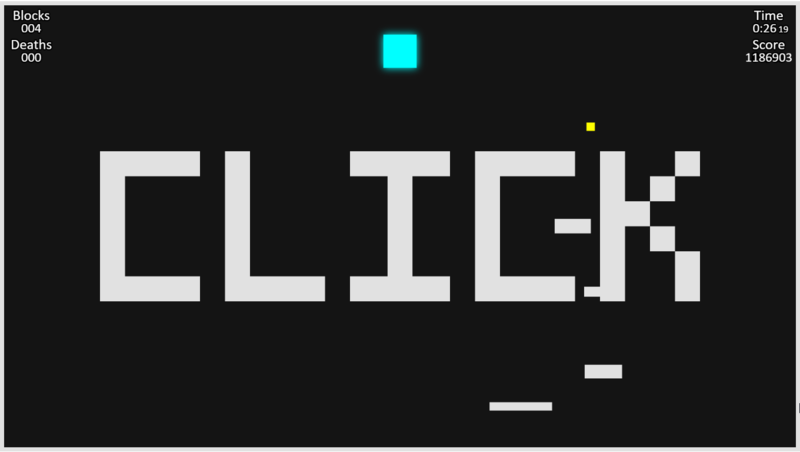 CLICK is a puzzle-platformer where you make the platforms in order to traverse the various levels. Try to get the best score by being fast, and using less platforms to place on the leaderboards! When can we expect 4.0? Walking at an angle shakes the screen, annoying. If I press Q to stow an item while teaching a robot, it doesn't stow the item, is there another way of making them? Or do I have to make them drop the item and pick it up again? This is all I have from Madgarden as of the moment. It is quite the shame, I'm so hyped for the game. Alright, sounds good, just curious. So, is the plan for RUMBLE to come out soon then? Or, is it going to be closer to winter? Cerebrawl community · Created a new topic Wow, it's finally out! Great job guys.